If there is any one thing I absolutely love, it is arcade games. Maybe it was just because I grew up around a lot of friends that were always heading over to the arcade or that you could get games with special controller systems like the Star Wars Arcade Game. But even then, just the experience alone was a thrill, which is probably why, out of all the console systems, Dreamcast will always hold out as a strong one for me. It had such a large selection of games that were either in arcades or could have been arcade games, and that includes one of my all-time favorites: Gauntlet Legends. Gauntlet Legends was the game I was playing with my friends both in the arcades and on the Dreamcast as soon as it had come out, as it incorporated some elements from a HUD with a lot of hack-and-slash. Of course the main element of a HUD was lacking; there isn’t a lot of story-telling going on for this game, but honestly it just wasn’t needed. This was my transition game from playing mostly action and blow stuff up kind of games to the more story oriented role-playing ones. This includes the whole reason I started playing table-top roleplaying games too. As for the game itself, it was cutting edge with mechanics and gameplay a decade and a half back and would be considered nothing of the sort today, but I still will play this game even today because it was pretty much the equivalent of playing the arcade version. The Dreamcast version was actually the closest to the arcade version compared to other console ports and it also included the most bonus material without changing the good and fun parts of the arcade version. 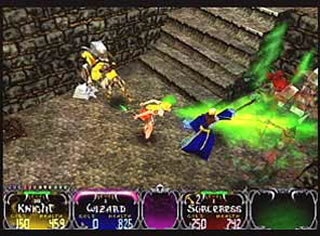 First, the dreamcast version is the only one that also included the character options that would later be introduced in Gauntlet Dark Legacy. This added Dwarf, Knight, Sorceress, and Jester to the playable characters (classes) in addition to the originals Archer (was Elf), Valkyrie, Warrior, and Wizard. Now it was true you couldn’t design your character the way you wanted but that wasn’t much of an issue when you consider the whole point of the game was to smash through dungeons, solve traps and beat bosses and from a side-scroll-y top-down point of view. This meant you weren’t exactly getting a good look at your character all the time anyway. If there was any game I’d actually compare Gauntlet Legends to, it would be the Diablo franchise, in fact Gauntlet Legends really paved the way for the Diablo 3 addicts, considering it falls into much the same system, you picked a specific class with maybe a few customizable options (like colors), and had abilities you unlocked as you leveled, while looking at your character from a top-down viewpoint, and running around smashing things, triggering traps, and exploring. Now what made Gauntlet Legends so brilliant to play wasn’t the story, as there was hardly ever one present other than an opening sequence for the dreamcast version. There is a basic plot and understanding of what you are doing but it is stressed so little that you don’t even need to worry about it. The true power was the simple aspect of being able to pick up and play a game with any of your friends, when you want to. It had a lot of the same appeal that is present with table-top games, except less character and world building. A full game definitely took a long time to get through, especially if you were with a couple friends and you were all fooling around by seeing what carts you could blow up and trying to attack each other. It simply had that fun appeal, but it definitely loses some of its flare when you aren’t playing with at least one other person. It also has a very rigid item system that can be frustrating for some people, as you can only shop in between levels and the items you get have to be used instantly, and you also can’t buy items to refill your health (those are food pick-ups while in levels). And that’s really the major issues with it, if it had a fully fleshed-out plot it probably would be one of my near top games. As a final major note, the soundtrack is definitely one of my favorites for any video game; it manages to pull off the fast paced beats that are needed for something like this. Of course there isn’t any major voice-over work other than the regular narrator most people are used to that says things like ‘Yellow Valkyrie requires food’. But the music itself is what is wonderful, not the cut-scenes. When it comes down to it, this game is somewhat of a niche. The main people who are going to enjoy it are Arcade Game lovers, and anyone who has friends to be playing this game with. It can get boring and repetitive quickly if you are by yourself, especially if you can’t enjoy the arcade version. If you don’t fall into one of those two categories, then you are better off finding an arcade with it to test it out before picking it up. Since graduating with a degree in game design, Terry Wilson has collaborated closely with both mobile app and software developers. In between contracts, Terry works with Game Design Schools, a resource for those aspiring towards a game design schools. When not writing or working, Terry plays entirely too many retro games on his twice replaced dreamcast.